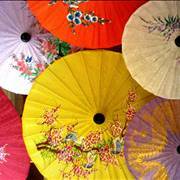 History of umbrellas is long and eventful. From the earliest appearances of simple palm leaf umbrella, long age of being synonym to wealth, to the modern time when is regarded as general item, umbrellas managed to intersect with our history in many interesting ways. Advancements in technology, changing tastes, and use in religion all enabled umbrellas to grow and prosper, becoming one of the principal ways we protect ourselves from rain. Protection from sun with umbrellas and parasols slowly faded out from fashion, which can be contributed to the rise in popularity of hats. 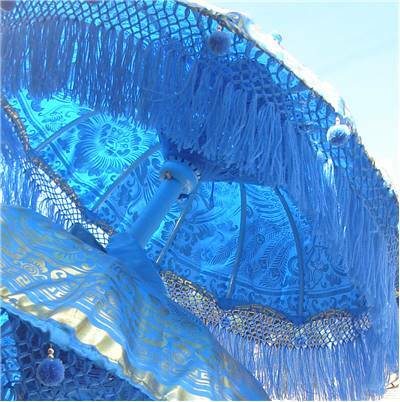 Parasols first appeared in ancient Egypt over 3 thousand years ago. Created to protect nobility and royalty from sunlight and enable their lifestyle that demanded pale skin, Egyptians never found a reason to waterproof their parasols and create umbrellas. 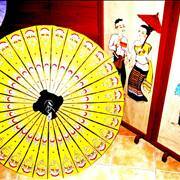 This invention was instead discovered in 11th century BC China, where first leather umbrellas started being sold at a very high price and used only by nobility and royalty. 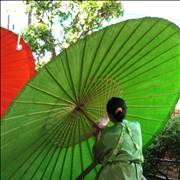 Rise of popularity of umbrellas in China did not managed to reach Europe before steady trade routes were established in the early part of second millennia AD. Because of that, Egyptian style of expensive non-waterproofed sun protecting parasols expanded to Greece and Rome where they were used almost exclusively by wealthy females. Male population of Europe looked at umbrellas as feminine product that is below them, and their pride forced them to endure harsh sun and rain with hats and coats. 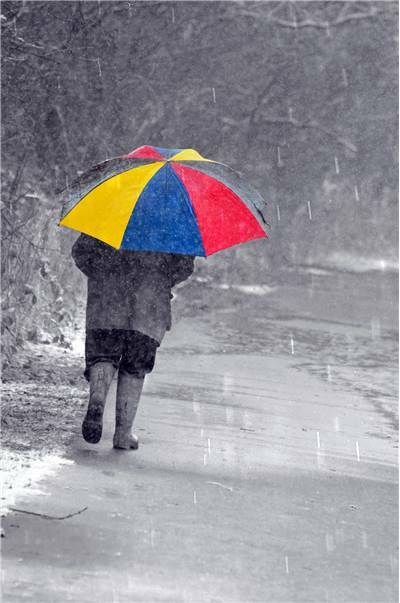 Fall of Roman Empire brought the end of the tradition of carrying umbrellas by wealthy females. Harsh environment, lack of food, constant wars, crumbling economy, poor personal hygiene and lack of technological advancement all led to 1000 year old absence of parasols and umbrellas in Europe. 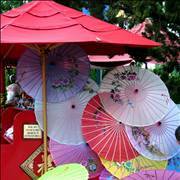 Only after the start of Renaissance in Italy, France and England did small and expensive female parasols returned to fashion (late 16th century), most probably influenced by the stories and paintings of distant Asian lands that were now accessible via land trade routes. Tradition of being female accessory continued to be enforced until the middle of 18th century when famous Englishman Jonas Hanway started carrying more sturdy and male oriented umbrella in every public appearance. Short 3 decade later his perseverance and stubbornness paid off, and English society started accepting umbrella as a general accessory that can be carried by everyone (when not raining their fashion forced them to carry umbrellas not by end of the handle but in middle, with handle turned toward ground ). This trend managed soon to spread across entire Europe, and countless inventors managed to improve its mechanical design and create numerous umbrella types that are in use even today. 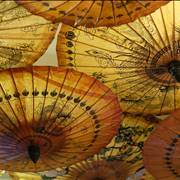 History of umbrellas managed to encompass three thousand years of human civilization, expansion and innovation. Here you can find out more about how umbrella managed to impact our culture and religion. Ever since the moment that first umbrellas found their home in several 3 thousand ancient civilizations, they managed to create profound connection with our culture and fashion. Her you can find out more about interesting umbrella facts. 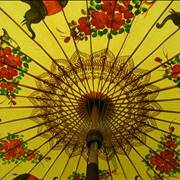 Thousand years of innovation and discovery enabled constant stream of improvements to umbrella design. 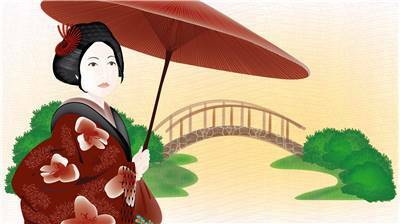 Here you can find out how umbrella changed through the centuries and how modern umbrellas are made. Some of the most important inventions in the field of umbrellas happened in 20th century. Hans Haupt managed to create foldable pocket umbrella in 1928, and Bradford E Phillips secured patent in 1969 which described first "working folding umbrella". Of course with the rise of the technology and ever increasing pacing of fashion, umbrellas even managed to find themselves in many roles - for example as cocktail decorations. Currently umbrellas represent general utility that is used by everyone, and for that purposes international manufacturers are producing truly staggering amount of this devices. Only in United States over 30 million umbrellas are bought annually, with majority of them being produced in China. 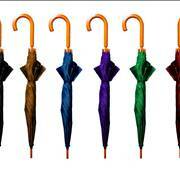 Classic Umbrellas - This several generation old design is opened and closed by with easy to use mechanism. Automatic Umbrellas - They have automated mechanical design which enables opening and closing with one hand. They are often small and compact, perfectly made to be carried in purse, briefcase or backpack. Pocket (Compact) Umbrellas - Small, lightweight and portable, often measuring to 9 inches long when closed. Some brands have mechanism for automatic opening and closing. Their small frame prevents them for being useful in heavy rain. Bubble Umbrellas - Their defining characteristic is transparent dome material (often plastic) which enables user to see better while walking around the rain. High Wind (storm) Umbrellas - These umbrellas are made from reinforced materials that can withstand more extreme qualities of rain and wind speeds. 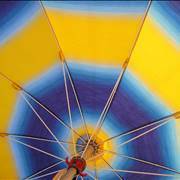 Some brands like GustBuster create umbrellas that can withstand winds of 55 miles per hour. Some experimental umbrellas have specific shapes that can be used even with 70 miles per hour wind.